Itinerant peddlers of sure-cure nostrums wandered throughout the Old West, being more diversion and entertainment than health. Traveling medicine shows brought excitement, to the dull existence of many frontier communities, as both doctors and diversion were scarce. 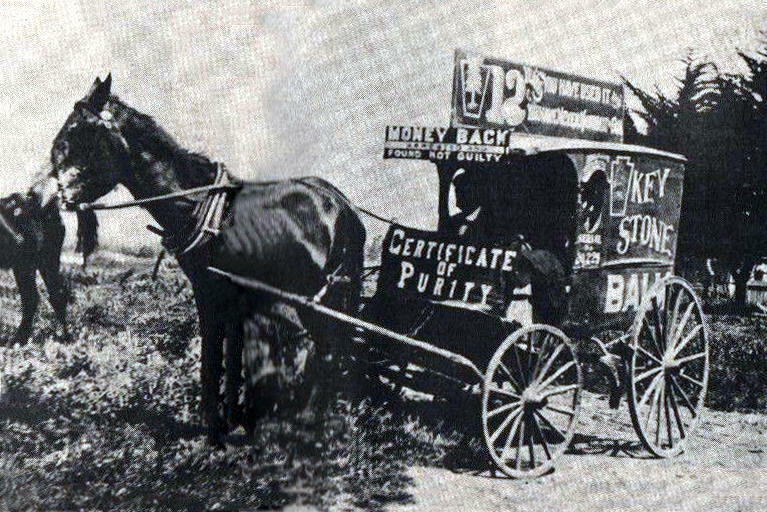 of patent medicines available to Western Pioneers. Drug store shelves were crammed with every imaginable kind of remedy, including Wel De Meyer's Catarrh Cure as advertised in this Georgetown, Colorado pharmacy. Diploma doctors were generally vigilant in their opposition to quacks in their ranks, but often the best of them used new devices of dubious merit in their attempts to find cures for their ailing patients. Patent medicine drummers used Indians and dancing girls to gather a crowd. They nearly always had a shill in the audience to buy the first bottle. Weird medicines were accompanied by weirder gadgetry as quacks sought to take advantage of the gullible unsophisticated frontiersman. Midwives, like Hilda Anderson Erickson of Tooele County, Utah (at left), served many Western communities where doctors were seldom seen. Some of them practiced "granny medicine" as well as delivering babies. Booze was often passed off as a medical panacea, as was Dr. C.B. Girard's Ginger Brandy advertised as a "certain cure" for a variety of ailments. The medicine "factory" of Dr. James Cook Ayer produced more than half a million daily doses of various remedies, including his famous Sarsaparilla and a hair invigorator. In notorious Dodge City, Kansas, in the 1880's a crude kiosk forbade the carrying of firearms and promoted Prickly Ash Bitters.